A hater is a slang term used in everyday language and especially online to describe an individual who talks and behaves negatively in response to other people's success and goal achievement. Haters might be jealous of their more successful counterparts, but they don't necessarily have to be. For a person to be a hater, they merely have to be criticizing another person's success — regardless of whether they secretly want that same type of success for themselves or not. Pretty clever, right? The acronym itself is a clear description of the word. People tend to use the term "hater" or "haters" when they need to segment the generally negative people from the positive people in reference to sharing their own or somebody else's success. You could say that the opposite of a hater is a fan. The term hater could also be used to call out somebody's hateful words or behavior in hopes of helping them realize that they're in fact, being hateful. 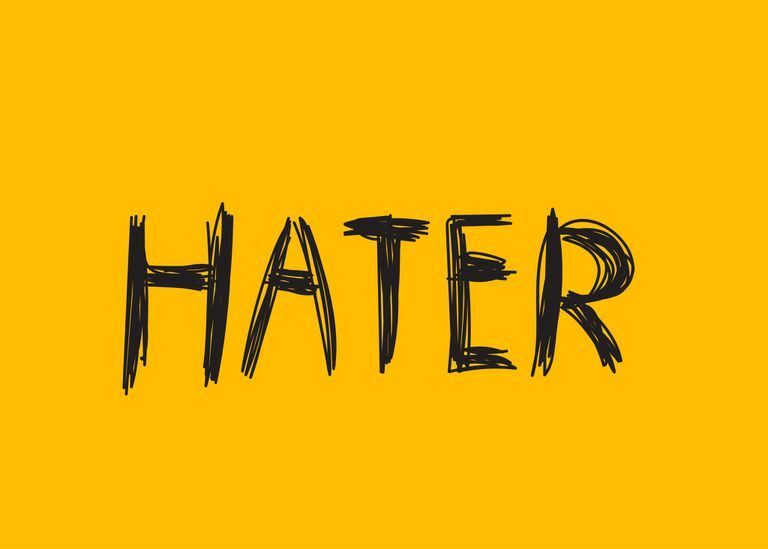 "Hater" is also sometimes abbreviated as "h8r." This is because the number 8 spoken as "eight" sounds the exact same as "-ate." "Don't let the haters get to you." "When you have haters, you're doing something right." They have strong beliefs or values that conflict with someone else's success. They feel ashamed or guilty about how little success they themselves have. They suffer from low self-esteem. They want attention and validation from others. Haters and internet trolls are very similar in definition and can be used interchangeably, but one of these terms might be a better fit than the other depending on the situation. The biggest difference between a hater and a troll is that a troll doesn't necessarily need to target somebody else's success in order to be hateful. Trolls will spew hateful comments at anyone they want, regardless of how successful or unsuccessful they might be. Trolls are entertained by the disruption they cause. Haters, on the other hand, want to make themselves feel better than the person they're being hateful toward. Find out what the 10 most common types of internet trolls are. Using the Term "Troll" vs. the Term "Hater"
If you were to see a comment on a YouTube video that said, "F*** you!" then the most accurate term to describe them would be a troll rather than a hater. Their comment is a general form of hate that doesn't specifically target some aspect of success or achievement shown or mentioned in the video. The crude commenter most likely just wants to get a reaction from the YouTuber and other commenters for entertainment purposes. On the other hand, if you saw a comment left on a YouTube video of a very popular YouTuber that was several sentences in length, criticizing or disagreeing with some specific aspect of success that was expressed in the video, then you could call this commenter a hater. The commenter is trying to lift themselves up in their own mind by putting the YouTuber down — and using their success as the basis of their argument. What Is Online 'Flaming' and What Are 'Flame Wars'?